What’s for dessert for Valentine’s Day? 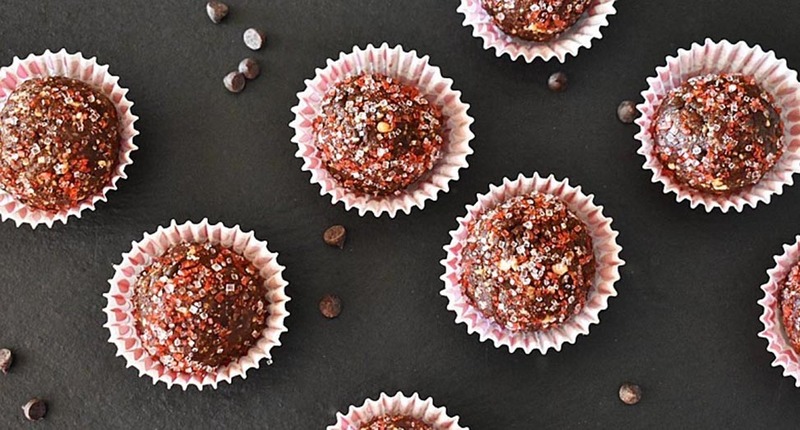 Step up your candy game with these six-ingredient chocolate cashew truffles, or whip them up for yourself any day of the year. Read: GET VALENTINE’S DAY GIFT IDEAS FROM THIS LIST! Made with almond flour, dates, cashews, and cocoa powder, these chocolate cashew truffles are easy to make in just a few minutes. Dress them up with red and pink sprinkles or dip them in melted dark chocolate to really get in the spirit. Place the dates, almond flour, cashews, cocoa powder, and maple syrup in a food processor. Pulse until the mixture is mostly ground. Add mini chocolate chips and pulse on low for another 10 seconds. Set the processor on the counter and remove the blade. If you’re rolling the truffles in sprinkles, pour a small amount of sprinkles on a small plate. Spoon the mixture out of the processor a few tablespoons at a time, rolling by hand into balls. Continue until you’ve formed eight evenly sized truffles. Roll each truffle in the sprinkles.